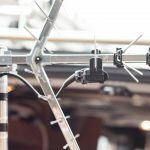 We have been in the TV aerial and satellite industry for over 27 years providing a local and professional service to our customers in Eastbourne and surrounding areas. Whether they’ve needed an additional TV point in another room or new installation to setting up their smart TV’s and home cinema kits, not only for domestic customers but we also work with local businesses, schools and property managers. When you are experincing a problem, we’ve got a solution for you. 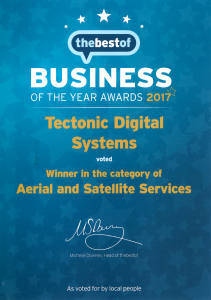 Our customers are so impressed with our service that they voted us Business Of The Year for Aerial & Satellite Services in not only Eastbourne but nationally with the Best Of Eastbourne. This was a great achievement for the whole team winning another award for our TV services and also a great way for our customers to feel involved by helping other consumers choose the right contractor for them and helping us win an award, because without them we wouldn’t have won. In March 2017, David L said about Tectonic Digital Systems – Arrived on time in smart clean van with smart uniformed engineers, fixed the aerial and wifi, tidied up and left. Charged a fair price. What’s not to like ? In February 2017, Gary L said about Tectonic Digital Systems – James, thanks for all your excellent work, very neat and tidy. Also thanks for taking care around our house, nice touch with the overshoes much appreciated. 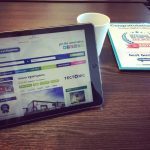 In January 2017, Helen Burton said about Tectonic Digital Systems – Tectonic put a screen on the wall of our Community Hub and were fast, efficient and very friendly to deal with. Everything you want from a local business! We’ve had a lot of our customers asking us for ‘How to’ videos, we have listened and we are extremely happy to announce we now have a YouTube channel which you can access, we currently have various videos for information about our services and using products we can install. We are currently working on various videos as requested of How To’s which we are hoping to get a couple completely in the next couple of weeks, check out our YouTube channel and subscribe so you can access our videos.